Ticker Sense has put together an interesting chart of the S&P 500 index breaking it up into 10 deciles. As you have most likely heard, large caps have the lowest PE ratios in the index. As small caps have outperformed large caps over the last several years, the valuations of large cap stocks relative to smaller ones have declined. 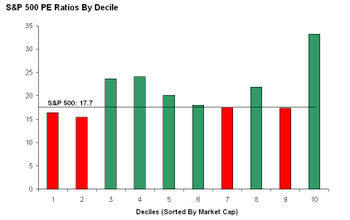 One way to illustrate this is by dividing the S&P 500 into deciles by market cap and calculating the P/E ratio of each. As the chart below shows, of the ten deciles, the two with the lowest valuations (based on trailing P/E ratio) are the ones that are made up of the 100 largest stocks in the S&P 500.